Have you ever had the urge to dive head first into a bag of potato chips or a tub of ice cream after a particularly long day at work, a crazy day with your kids or a frustrating argument with a loved one? Don’t worry you’re not the only one. Turning to high-calorie salty, sugary and fatty foods is basically a natural response to high-stress situations. But why do we suddenly develop this impulse to essentially “pig out” on foods that we know don’t provide our bodies with many benefits, and how can we prevent this cycle from leading us to develop unhealthy eating habits in the long-term? To get a better understanding of the relationship between stress and unhealthy eating, we consulted Christy Shatlock, R.D., a lead dietitian at bistroMD. The Active Times: Let’s start with the basics. What happens in our bodies when we're stressed that leads us to reach for “junk” foods? Shatlock: To deal with stressful situations (whether physical or emotional) your body responds by releasing a surge of hormones including adrenaline and cortisol. Cortisol is your primary stress hormone that is released during long-term periods of stress. Cortisol actually increases your appetite. If you are in a constant state of stress your cortisol levels may stay elevated (Dina Aronson, 2009). Many studies have shown that in times of stress people increase their intake of foods high in fat, sugar or a combination of both due to the high cortisol levels in their blood. These high-fat and high-sugar foods are “comfort foods” in that they seem to counteract stress by sending feedback that inhibits activity in parts of the brain that produce and process stress (Gibson, 2000). Alternately, during periods of short-term stress most people’s appetites are actually diminished. This is because of the release of adrenaline (epinephrine) from the adrenal glands. This is the “fight-or-flight” hormone and due to the “revved up” state it can temporarily shut down your appetite. Not eating due to a lot of short-term stressors can be just as unhealthy as eating too much due to long-term stressors. Are there any other negative side effects associated with this pattern? Shatlock: Constant states of stress can also lead to sleep deprivation. When you are tired all the time your body is craving energy. The fastest way for your body to get energy is through carbohydrates. People tend to “crave” sugary foods when they are tired and stressed because this will increase their blood sugar and give them more energy. However, this boost of energy doesn’t last long. When you eat sugary foods and your blood sugar increases, your body releases a hormone, insulin, which is sent to lower your blood sugar. When your blood sugar is low your body will crave that sugar again for energy and we start the poor blood sugar balance cycle. Also, when you eat a high-sugar, high-fat food you actually turn off the mechanism in your brain that sends out the signal that you are full and therefore you overeat and can pack on the pounds. Remember this when choosing foods like ice cream, cakes, cookies and candy. In your opinion, what aspect of a healthy diet does constant stress place the biggest toll on? Shatlock: I would say constant stress places the biggest toll on portion control. When you are constantly stressed and constantly trying to relieve that stress to no avail most people tend to overeat. Not only do you choose the high-fat or high-sugar foods to try to combat stress, but when this does not solve the stressful situation you tend to eat more and more of it in attempts to get rid of the stress. Stress is manageable but also an inevitable part of life, can you recommend any tips that might help us recognize the signs of feeling overly stressed so that we can make sure our healthy eating habits stay on track? Shatlock: I think one of the best ways to recognize stress is to keep a journal. If you can write down your feelings whether they are feelings of frustration, anxiety, negative thoughts, etc. for a given situation or challenge you can start to identify certain triggers or patterns for your stress. After you have identified those triggers or patterns you can be aware of them and have a plan in place for when they come up again. I often have bistroMD customers keep food journals. This is not only to write down what foods they eat, but also what was happening around the time they were eating, how they felt after eating the food and even where they ate that food. Keeping track of these things helps to find a pattern to certain eating habits. Understanding our stress and being aware of it is one thing but being prepared for it is another. 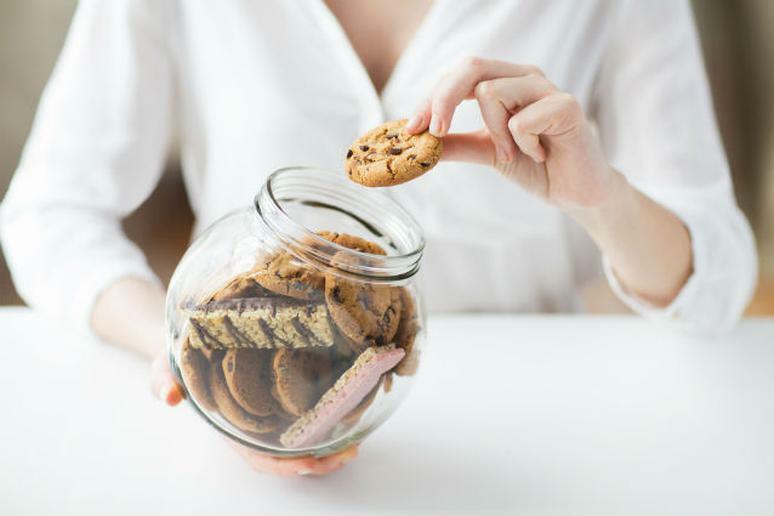 Since we know that stress (whether short-term or long-term) has an impact on your eating habits having prepared snacks or meals is the best way to navigate stress without adding on the pounds. I always recommend having healthy snacks on hand that are easy, grab-and-go snacks. They should contain a healthy carbohydrate to boost blood sugar and energy but they should also contain a healthy protein or fat to maintain that blood sugar and prevent the sharp decline that happens when insulin comes in to lower the blood sugar. What if you're stressed and really craving your favorite kind of "junk" food? Do you recommend giving in to the craving by having just a small portion of it, or maybe opting for something similar but healthier instead? And if someone really did want to indulge a little, what are some ways they can make sure they don't go overboard? Shatlock: My motto has always been that nothing is ever “off limits” and if you continue to stave off a craving over and over again, eventually you may lose that motivation and go way overboard with eating that food. I always tell our customers that if you are stressed and really craving something go do something else for five minutes. Go for a walk—exercise is a great way to relieve stress and as a bonus can help maintain your weight— play a game, start a load of laundry, get a cup of coffee or tea (drinking warm liquids can help with cravings and put hunger at bay), anything to take your mind off the craving. If it’s just a craving due to stress this craving will most likely go away. Ideally we would all like to say that we are able to opt for the healthy choice in times of stress but sometimes “caving” to your craving and indulging a little isn’t the worst as long as you watch portions. Do you have suggestions for a few snack options that are healthier, but that can also help to quench cravings? Shatlock: Go ahead and have that chocolate but instead of a Hershey kiss (or two) have one ounce of dark chocolate covered almonds. The chocolate will help with the craving, boost your mood and can help lower your blood pressure which can make you feel calmer; and the protein and healthy fats in the almonds will help relieve the stress. Keep little snack bags on hand that are pre-portioned just for times like these. That way you can grab one bag of your chocolate covered almonds and not worry about eating too many right out of the bag. If you are craving something sweet instead of going for the ice cream try some Greek Yogurt with some fresh berries mixed in. The Greek yogurt is full of protein and the berries are sweet and loaded with vitamin C, which has been shown to help combat stress. If you are craving something salty try some homemade guacamole with baked pita or kale chips. Avocados are full of potassium which can help lower your blood pressure. Again, remember your portions. Make individual servings of guacamole and put them in Tupperware containers and you can put a serving of the “chips” in a bag. This way you can grab one bag and one Tupperware container to help combat your stress related craving. Dina Aronson, M. R. (2009). Cortisol — Its Role in Stress, Inflammation, and Indications for Diet Therapy. Today's Dietitian, 38. Gibson, E. L. (2000). Stress and food choice: A laboratory study. Psychosomatic Medicine (Impact Factor: 4.09). , 853-865.